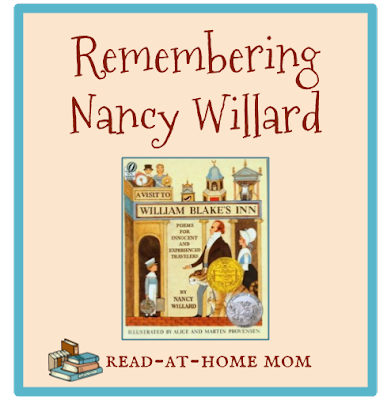 Newbery Medalist Nancy Willard passed away on February 19, 2017 at the age of 80. When I read her obituaries, first from The Poughkeepsie Journal when it was published there last week, and then yesterday from The New York Times, I was reminded of the semester early in my college career when I had the opportunity to take a course taught by Ms. Willard. In her memory, I want to share my impressions of that experience today. In the Fall of 2000, I was just turning 18 years old and I was in the first semester of my freshman year at Vassar College. I chose to attend Vassar because I thought (foolishly, I would eventually realize) that it would turn me into a great fiction writer. When I saw in the course catalog that an instructor named Nancy Willard was offering a class in the Education department called The Writing of Children's Books in the spring semester, I knew I wanted to be a part of it. I didn't know who Nancy Willard was, but I had always been drawn to the idea of writing for children, and I thought this would be a great opportunity to begin the study of writing I had enrolled in college to pursue. I submitted a writing sample, and I was one of two fortunate freshman to be given a seat in the class. I wish now that I could remember more specific details of the class as a whole. I believe we met in Blodgett Hall (which is where the education department was housed) and I have some sense that the room we were in was dim and close, with the 15 or so members of the class sitting casually around a large wooden table. I can remember feeling a sense of kinship with the only other freshman in the class and joking with her about how truly old the juniors and seniors in the class seemed compared to us. I also remember many of the titles from the reading list: Elsie Piddock Skips in Her Sleep, Regarding the Fountain: A Tale in Letters of Liars and Leaks, Miss Hickory, Annie John. The pieces I wrote for the class stick in my mind more strongly, because I think they were truest to my own voice. For one assignment I wrote a nonsense poem which began "Alfred was a baker/he baked a cake of shoes" and ended with "Alfred, baking failure, became a hairdresser instead." I also wrote an epistolary picture book about the North Pole, in which Santa's elves go on strike with just hours until Christmas Eve. Ms. Willard called it publishable, a compliment which I have only recently come to recognize as the gift it really was. This is the only creative writing course for which I never struggled to find inspiration. The assignments were all fun, and they made me want to play and use my imagination. I think the most memorable part of the class, though, was sharing personal stories. I remember quite well how surprised and charmed Ms. Willard was when I relayed my own personal anecdote about seeing the name of my childhood imaginary friend, Lena Farina, in the obituaries when I was in high school. This was a class where the weird and magical things that happened to us as kids were not just appreciated, but enjoyed and used as inspiration. Indeed, after three more years at Vassar it would become clear to me that there was something different about Nancy Willard as compared with other creative writing instructors. She valued imagination over academics and people over politics in a way that others did not always. At the end of the semester, Ms. Willard presented each individual member of the class with a handmade gift. Each was a hand-painted game board, charting our journey through the semester. Each one was decorated with little visual hints at the pieces we had written and the personal childhood memories we had shared. On mine, among other things, were a cake made of shoes and a tiny silver gravestone bearing the name, "Lena Farina." I didn't know when I was at Vassar that I would later become a children's librarian, a published author, a blogger about children's books, or a mother of small children. But certainly, this class, with this unique writer as an instructor, must have planted at least a seed or two that led to the kind of work into which I would eventually fall. It is sad to know that she is no longer with us. Nancy Willard's 1982 Newbery Medal winning poetry picture book A Visit to William Blake's Inn: Poems for Innocent and Experienced Travelers, also won a Caldecott Honor for its illustrations by Alice and Martin Provensen. Her other books for children include Pish, Posh Said Hieronymus Bosch, Step Lightly: Poems for the Journey, The Mouse, the Cat, and Grandmother's Hat, and Gum, illustrated by Jeff Newman, which will be published posthumously by Candlewick this October.